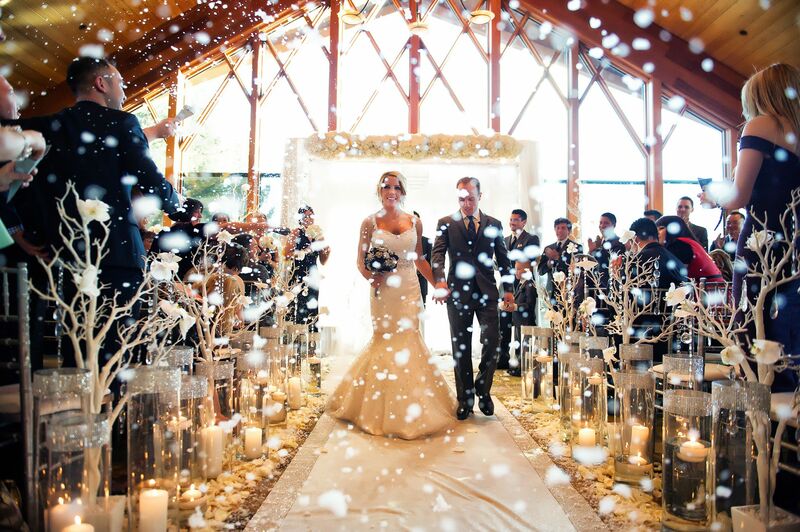 Have you always dreamed of having a winter wedding? While not the most popular season for a wedding, winter can provide this special occasion in your life with a truly gorgeous fairytale look. Since the whole appeal of a winter wedding is the fact that you can get married surrounded by snow and beautiful scenery that is bound to make for some eye-catching pictures, it makes sense to look for garden venues that can give you just that. Because we want to provide you with some inspiration before choosing your winter wedding location, we thought we would gather 6 of the most breathtaking winter garden wedding venues that are perfect for a wedding in the cold season. If you want your wedding to be both luxurious and fairytale-like, then you should definitely look more into the Ritz-Carlton Lake Tahoe venue in Northern California. 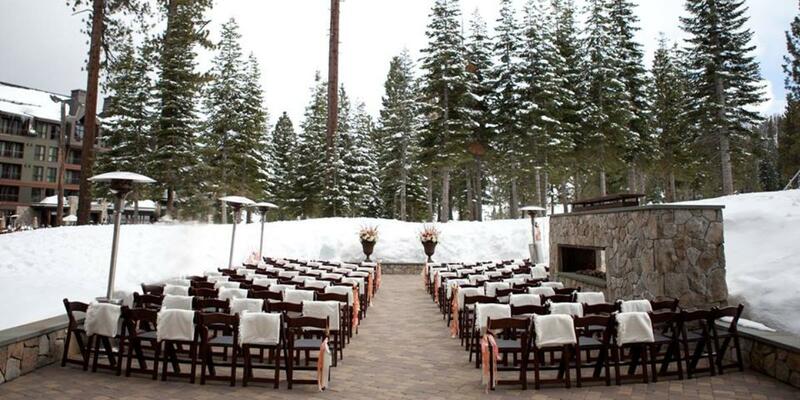 Choosing this winter garden wedding venue means you’ll get to say your “I do” while surrounded by snow-covered pine trees and overlooking the Sierra Nevada mountain range. If you’re worried that the cold weather might make it impossible for you to have your wedding there, then you should put those worries to rest. The personnel at the Ritz-Carlton will arrange a cozy fire where you and your guests can gather around. Not to mention the fact that the fire will provide the entire wedding with an even more whimsical look. You have three winter garden wedding venue options, all offered by the Ritz-Carlton, each more lovely than the next. The first option that drew our attention is The Woods, due to its woodland environment. 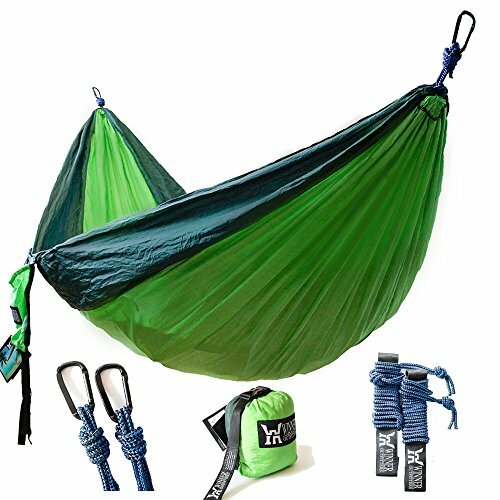 For people who love nature and particularly forests, this is a great option. The next one is called The Meadow and it promises that you’ll get to have your wedding ceremony on a mountaintop while surrounded by romantic and lush decorations. Finally, last but not least, the Fireside Terrace is where you can cozy up next to a seven-foot fire, while also being outside in the snow. Another gorgeous winter garden wedding location in California, this one is perfect for people who want to experience nature but also avoid the winter cold. How is that possible, you ask? Well, by having your wedding on a lawn and your reception in a solarium. 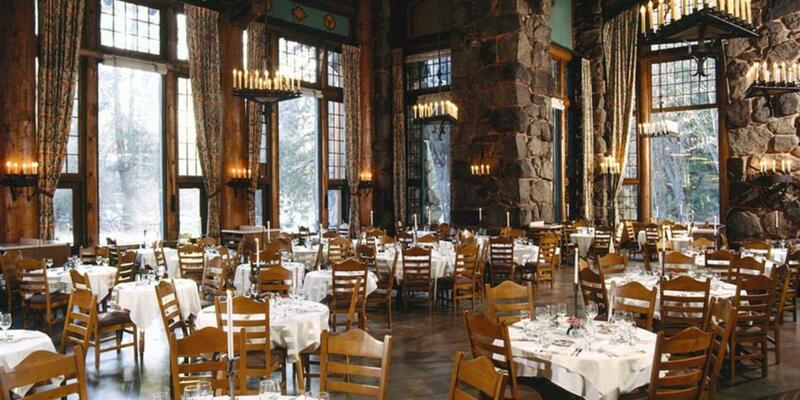 This hotel is situated in Yosemite National Park, which only makes it even more special. In fact, it’s quite famous in that area, due to its architecture and façade, and the wonderful landscapes that surround it, which include the Glacier Point, the Yosemite Falls, and the Half Dome. If you like historical locations as well, then this one won’t disappoint. It’s the perfect combination of luxury and history. If this sounds appealing to you, then you should know that if you book this venue for a wedding, you’ll say “I do” with Glacier Point in the background. Then, as if this wasn’t enough, you and your guests will get to enjoy a beautiful solarium reception. The solarium has floor-to-ceiling windows. 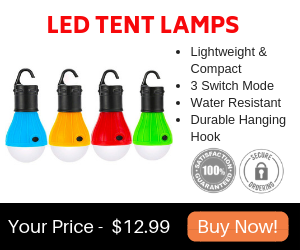 This means that you’re going to feel as if you’re still outside in the snow. The upside is that the temperature won’t be as low. Moreover, the solarium also contains a local jasper fountain, which contributes to the outdoorsy feel and look of the reception. 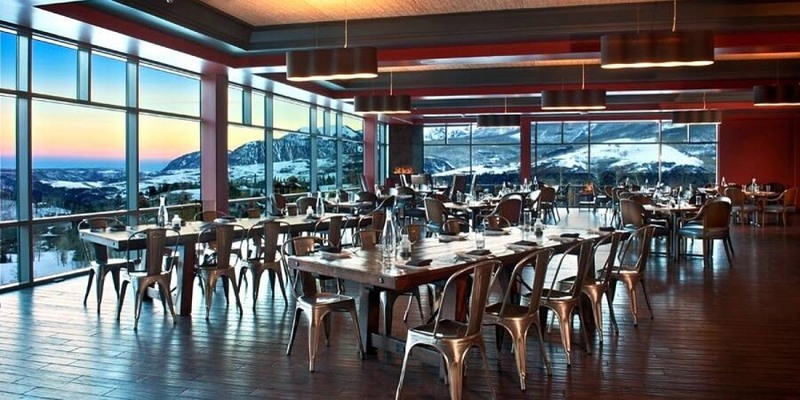 You can find the Peaks Resort & Spa in a Colorado mountain town called Telluride. Here, the unique and breathtaking sunrises that cast a magical light on their surroundings complement the beauty and dignity of the San Juan Peaks. You can have your wedding ceremony either on the deck or on their terrace. Either way, you’ll be able to enjoy a spectacular view that guarantees to make for an unforgettable wedding day. If you want to capture the otherworldly glow of the sunrise in your wedding photographs, we recommend you to time the ceremony with this idea in mind. When the ceremony is this special, the reception can only be equally as exciting and unique. You can have it in their ballroom, which is undoubtedly elegant, yet still manages to capture a little bit of the outdoorsy spirit that dominates the ceremony. Plus, the room has only glass walls. This guarantees an amazing view and the feeling that you’re literally celebrating your wedding on top of the world. Moreover, you should know that the staff is open to suggestions regarding anything that could make your wedding day even more special. Even if you only have to drive for a half an hour to get from the center of Atlanta to the Foxhall Resort & Sporting Club, it feels as if you’re in a completely different location. 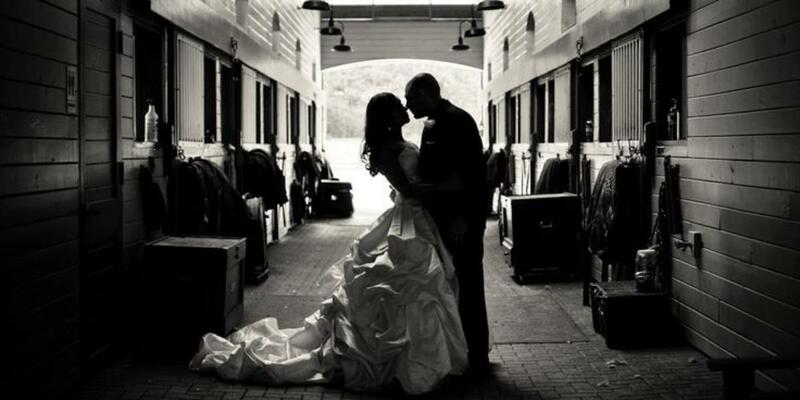 If you want to escape the crowded city and enjoy a rustic winter garden wedding in a venue located next to wooded hills, the Chattahoochee River, and some stables where you can take pictures with the horses, then this resort is the right choice for you. They don’t only offer outdoor weddings, but these are clearly one of their best options. The accent here is not placed on luxury, although we can’t say that this feature is completely absent either. Still, the idea is that the wedding should look pastoral and intimate. Moreover, it should provide the bride and groom with a simple yet unforgettable wedding day. One of this venue’s biggest advantages is the fact that it’s next to some stables. This makes for really interesting wedding pictures. Speaking of rustic winter garden wedding locations, the Union Hill Inn in Sonora, California is possibly one of the most magical places where you could get married. At the same time, this gorgeous location is also refined and entertaining. If you’re wondering where you can have your wedding ceremony, the answer is in many places. Out of the most notable, we must mention the lawn, which looks amazing in the cold season. However, perhaps the best one is under the massive heritage oak that they have on their premises. The oak won’t only provide your entire wedding with a more intimate feel. It will also make sure that your wedding pictures are truly unforgettable. Many people decide to have their wedding here because they can turn in into the perfect weekend getaway. Guest won’t have to simply spend their time around the inn area, although they definitely can opt for that as well. Still, there are so many things to do close by, that it would be a shame not to take advantage of the opportunity. For instance, the inn is located near Jamestown, Historic Colombia, and even Lake Tahoe and Yosemite National Park if you’re willing to take a day trip. If you prefer to hang around the grounds, there’s plenty of things to see there as well. 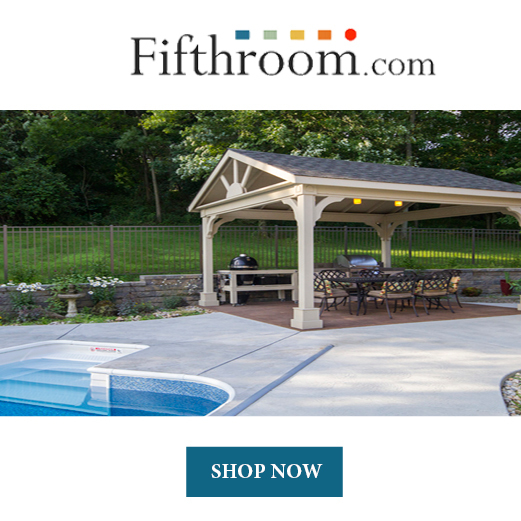 They have a footbridge, a pavilion, a gazebo, barns, ponds, and many others. 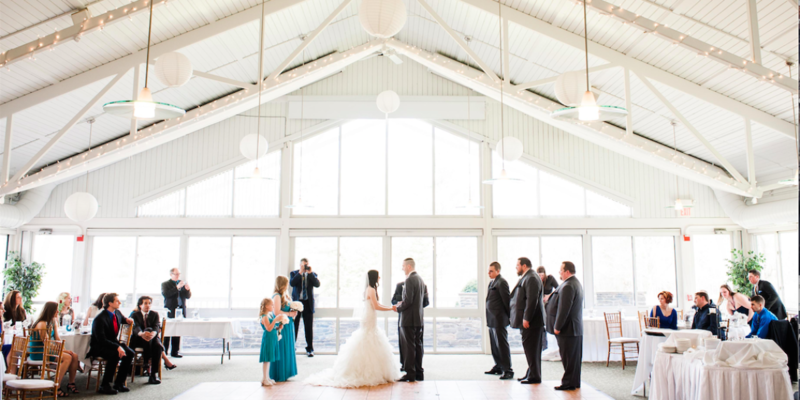 Finally, another picture-perfect place for your wedding ceremony and reception is the Atrium at the Essex Resort & Spa in Vermont. What’s so special about this atrium is the fact that it allows you to get married by the gazebo. This way, you’ll take full advantage of the wonders of winter weather. The property where this winter garden wedding venue is located is surrounded by forest and idyllic landscapes. We think this is something everyone looking to get married in the cold season would enjoy. You also shouldn’t miss the Vermont countryside when you’re taking your wedding photographs. That’s because you can capture it quite beautifully on camera as well. The room that is available for the reception doesn’t disappoint either. As is only natural in a location that focuses on providing its guests with gorgeous views, the atrium has tall walls made of glass. This offers a spectacular view of the estate’s surroundings. 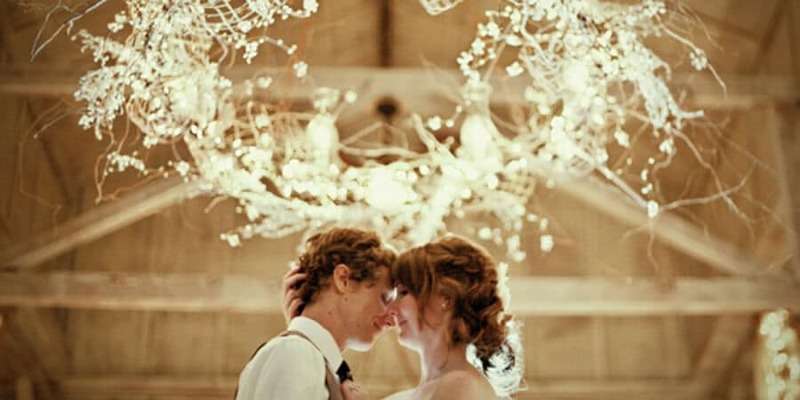 The room is elegantly decorated and it has string lights that twinkle above the tables and dance floor. What more could you possibly wish for in a whimsical wedding? This wedding location manages to perfectly balance the rustic feel provided by the outdoor ceremony with the elegance and luxury of the atrium where you can have the reception. Winter weddings can indeed be more challenging than your typical fall wedding, for instance. Even so, we think the experience definitely makes up for the extra effort you have to put in, and we’re sure you agree. Moreover, we hope today’s guide to 6 of some of the most gorgeous winter garden venues where you can say your “I do” has managed to provide you with just the right amount of inspiration for your upcoming wedding. No matter the option you decide to go with, the landscapes, the weather, and the decorations will definitely turn this event into one of the most special days of your life. Before we go, we would like to suggest you take a look at the video below if you want to learn how to make your own winter wedding table centerpieces for a winter wonderland look. Just make sure to buy some cans of snow spray, a silver glitter spray, some silver metallic ribbons, a couple of Christmas ornaments, and double stick tape before you start.